The Maximus Smart Security Light is an aesthetically designed light in Traditional look with a built-in home security all-in-one. The Smart Security Light detects someone approaching your home, sends a real time alert, and makes it possible for you to engage in a live conversation or sound an alarm - all from your smart phone. The light is easy to install in approximately 15 minutes when replacing an existing light fixture. No extra wiring is required. The light can be turned on and off remotely, a schedule be set, or automatically turned on in dusk-to-dawn mode or activated in response to motion from the smart phone. Alerts are sent to the smartphone immediately when someone is approaching. The video data can be stored in the KUNA cloud and is accessible everywhere. The light can be controlled by setting schedule or turning it on/off from the app. The live video and the 2-way audio service are free of costs. Manual override allows light to be turned on/off as needed. The light comes with Auto-On feature at night. The fixture is weatherproof. Add a modern touch to your household exterior with this cylindrical 1-Light Metallic Grey Wall Lantern from Progress Lighting. Measuring 6-inch Dia and 12-inch H with heavy-duty aluminum construction, it has a closed top and open bottom to shine light downward on architectural features, landscape greenery or whatever borders your home. The sleek design of this wall-mount fixture offers a superb low-profile option for illuminating building exteriors. A weather-resistant powder-coated finish protects this stylish lamp from harsh environs and the fixture is UL Listed for wet locations to withstand damp conditions. 6 in. cylinder with heavy duty aluminum construction and die cast wall bracket. Sleek design offers a superior low-profile option for lighting building exteriors. Features 2-light configuration which illuminates both up and down - creating a dramatic lighting effect. Powder coated finish. 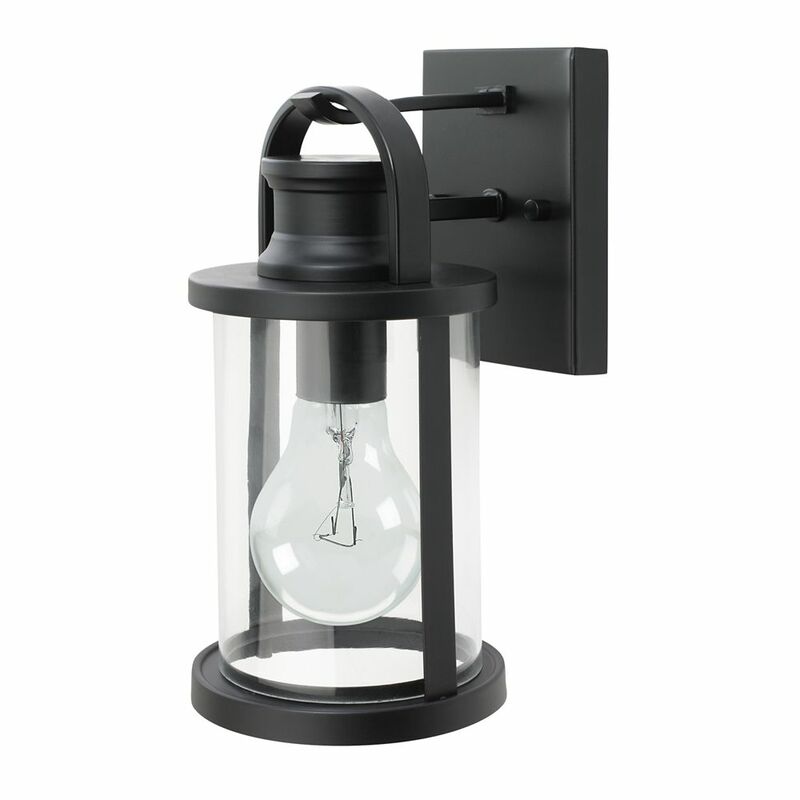 12-inch Sleek Outdoor Wall Lantern with Clear Glass Shade in Black This outdoor light fixture welcomes your guests in style and in safety, illuminates distinctive features of your home and/or garden, and creates an added ambiance for evening outdoors. This outdoor light fixture is fully weather resistant, making it suitable for any outdoor environment. This exterior light fixture is ideal for outdoor use, providing illumination to porches, entryways, and wherever additional lighting is needed. This fixture is ideal for outdoor use, providing additional illumination and ambiance to walkways, porches, gardens, and wherever additional lighting is needed. Includes all mounting hardware for quick and easy installation and requires one 60W equivalent A-Type E26light bulb (sold separately).